Freelance writer and emerging author, featured in . . . 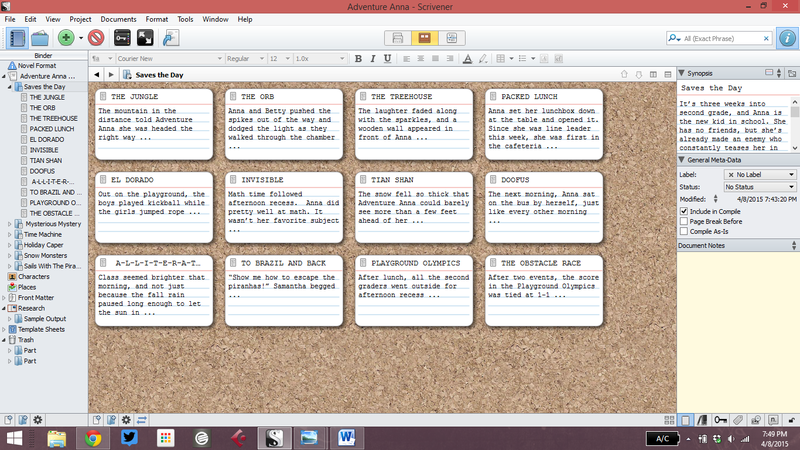 So after many months of thinking about it, I finally broke down and downloaded Scrivener. Lots of my fellow writers rave about it, and it sounded really useful. Plus you can try it for thirty days for free. I had nothing to lose. I started the tutorial yesterday and finished it up today. It is long and very thorough, and by the time I was done I felt like I had a good grasp of the application. So I started a new project (that was really an old project). I imported all my Adventure Anna drafts to date into one large “novel with sections.” I figured that since I was writing a chapter-book series I could treat the whole series as one book in multiple parts, with each part divided into chapters. This is my Adventure Anna project. I was able import each story (from Word), transform each one into a folder, and split the chapters at the chapter title. As you can see, each of the documents in the “Saves the Day” folder is automatically named after the chapter title. On the left, Scrivener shows a hierarchical list of all the books with the chapters as subheadings in each book. Since the chapters are short enough to equal scenes (or sometimes parts of larger scenes) I don’t need a further set of sub-subheadings for scenes in a chapter. But in a novel with multiple scenes per chapter I could do that. I could also move them around, which is a big plus. I’ve set the main window to cork-board view, and Scrivener is displaying each chapter as a stack of index cards with summaries at the top. In this case, I just pasted the opening line of each chapter. I could easily compose summaries instead, but I took the quicker route for this example. On the right, Scrivener displays the synopsis of the whole story (which I pasted from here) and other windows I’ll get to later. This is just a taste of what Scrivener can do. I look forward to working more with this software, and seeing how it can assist my creativity. Tags: authors, chapter books, fiction, novels, organization, projects, reviews, Scrivener, software, tools, Writer Wednesday, writers. Bookmark the permalink. A stay-at-home dad's thoughts on parenting and life. That one day, we will all hold hands and D A N C E in heaven, like birds on trees, being moved by the warm magnolia breeze, like purple annuals and yellow perennials growing in the same garden of love.